The Turkmenistan Flag, often described as one most detailed flag in the world, was officially adopted on 19 th February, 1997. The Turkmenistan Flag has a green background. The region of Turkmenistan has been inhabited by nomadic tribes since ancient times. Alexander the Great came and ruled the land in the 4th century, building massive cities during his reign. It was part of the Persian kingdom when the Arabs came and conquered during the 8th century. During the 11th century, the region was conquered by the Seljuk Turks, followed by the invasion of Genghis Khan in the 13th century. In the 14th century, the region was ruled by Timur and its breakup in the late 15th century led to the rule of the Uzbek empire. In the late 1800's, Russia conquered the Turkmens, absorbing the region into the Russian kingdom in 1894. Due to the October Russian Revolution of 1917, Turkmenistan became the Turkmen Soviet Specialist Republic, which came under control of the Soviet Union. Turkmenistan achieved full independence on October 27, 1991, and international recognition occurred on December 25, 1991, a day before the Soviet Union was dissolved. The nation then came under the control of a President for Life under a single-party system until 2006. By 2008, Turkmenistan's government implemented a resolution adopting a new constitution that allows for a multi-party political party system. 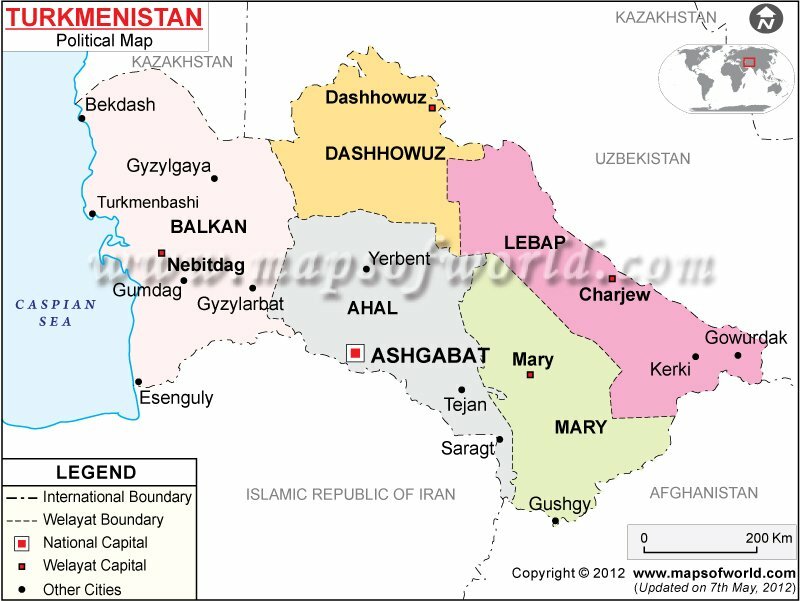 Turkmenistan is located in Central Asia, with borders that include: Kazakhstan to the northwest, Uzbekistan to the northeast, Afghanistan to the southeast, Iran to the south, and the Caspian Sea to its west - with a coastline of 1,768 km. Over 80% of the country's total land area is covered by the Karakum Desert, with the central regions dominated by the Turan Depression. Turkmenistan is a unitary presidential republic. The President is head of state and head of government, and head of a multi-party system. The dominant party is the Democratic Party of Turkmenistan. There are 3 branches of government: the executive branch, the legislative, and the judicial. Executive power is exercised by the President and the Council of Ministers, while the legislative power is exercised by the Mejlis or Parliament, and the judicial power is vested in the Supreme Court. Turkmenistan is a popular Central Asian travel destination for its architecture and archaeological sites. Among the most popular destinations is the capital of Ashgabat - the largest city and located between the Karakum Desert and the Kopet Dag mountain range. It's a modern metropolitan with a rich history and culture. One of the city's most visited tourist sites is the Turkmenistan Ruhy Mosque - which is the largest mosque in Central Asia. An hour away from Ashgabat is the Kow Ata Underground Lake - a naturally heated lake that contains 38 chemical elements and found 65 feet into a dark cave. Famous with locals and tourists, people swim in the 96 degree Fahrenheit waters that contain sulfur, potassium, magnesium, sodium, chlorine, and other chemicals that are touted to have medicinal abilities. Most of the tourists who visit the lake are there in the hopes that the water will cure their ailments. The ancient Merv is the biggest archaeological site in Central Asia. A complex of walled cities found along the Silk Road, the ruins are found near the city of Mary in the Mary Oblast region. The Merv is a UNESCO World Heritage Site that was first built during the 4th century - under the rule of Alexander the Great. Many other kingdoms have made the Merv its capital and its remains today are considered to be one of the best-preserved and oldest oasis-cities in the world. Old Nisa is an ancient city found 18km south of Ashgabat. It was the first seat of central government of the Parthian kingdom, and the Parthian Fortress is the city's tourism highlight. The fortress consists of a small complex that's filled with richly decorated architecture. Education in Turkmenistan is mandatory throughout the secondary level or until the 8th grade. Formal education starts at kindergarten and primary school. Those who are accepted into higher education receive stipends from the government's education budget. Since education is highly accessible, most of the adult population are well educated. There are 23 higher education public institutions in the country - 18 are civil and 5 are military higher education institutions. Turkmenistan boasts of a highly literate population, with an adult literacy rate of 99%. Turkmenistan is the 2nd wealthiest country in Central Asia. Gas and electricity in the country are free for all residents. Turkmenistan's woven carpets are famous throughout the world. A flagpole 133-meter high in Ashgabat is one of the tallest in the world.